Ana's Arrow by Riley Evans, a Mysterious Review. 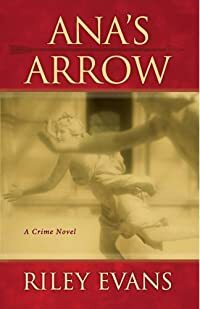 Review: Riley Evans' decidedly odd legal thriller, Ana's Arrow, asks the reader to determine the fate of the narrator, western Kansas attorney Tom Spaulding: Is he guilty of murdering a priest with an arrow that belonged to his wife, or is he innocent of the crime of which he is accused? The gimmick of Ana's Arrow, and yes it is merely a gimmick, is that at the end of the book the outcome of the trial of Tom Spaulding is not known. Readers can register their opinion online and presumably at some point in the future, the true verdict will be revealed. The real question is, will anyone care? There are so many issues with this book it's hard to know where to begin. The concept of allowing the reader to play the role of a jury member and proffer their verdict is intriguing. But the trial doesn't start until well into the second half of the book and up to that point the narrative is ponderous to the point of being unreadable. It's likely a lot of potential jurors will drop out long before jury selection begins. Riley Evans tries to imbue in Tom Spaulding a complex set of favorable and unfavorable characteristics in an attempt to appear impartial to potential jurors (i.e. readers). But the effort isn't successful. Tom is not a likeable character. He claims to be in love with Ana, but he's far more in lust than anything else. His concern for her is directly proportional to the physical pleasure he derives from her company. He's arrogant, egocentric, and at times condescending to his friends and colleagues. He's also vulnerable and, especially late in the book, humiliated in the presence of his peers. This combination of (perceived) strength and weakness in the end comes across as merely pathetic. The mythological aspect to the story also has possibilities, but is handled so clumsily and inaccurately that it loses any credibility. Are Ana and her best friend Helen the embodiment of their ancient Greek counterparts, or are their actions simply psychotic episodes in the mind of Tom Spaulding? Then there are the distinctly unfinished, or maybe just poorly edited, facets to the book. Subplots abound but are infrequently tied together, more rarely concluded, and in some cases seem so tangential to be inconsequential. Characters are introduced with some apparent significance to the plot, then disappear, are killed, or otherwise are sidelined, with no resolution to their being. It's entirely possible that all the noted flaws in Ana's Arrow are intentional, that the book is a metaphor for an actual murder trial, one where hours of mundane, tedious details and mind-numbing background material suddenly evolve into brief moments of riveting testimony. If this is the case, the author has achieved his goal brilliantly. Acknowledgment: StoryWrite Books provided a copy of Ana's Arrow for this review.